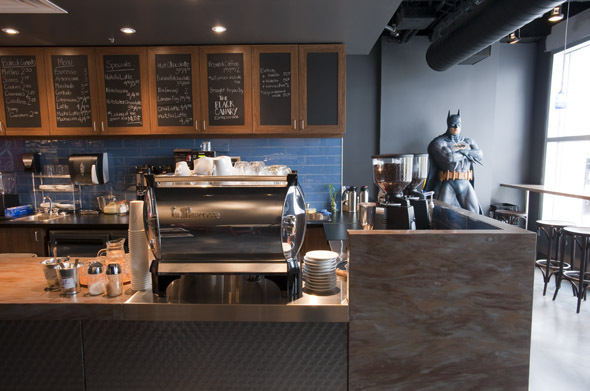 The Black Canary Espresso Bar (Yonge) is the place to get a hot Nutellacino (that is, Nutella Cappucino to the layman) while catching up on the latest disarray in Gotham City. 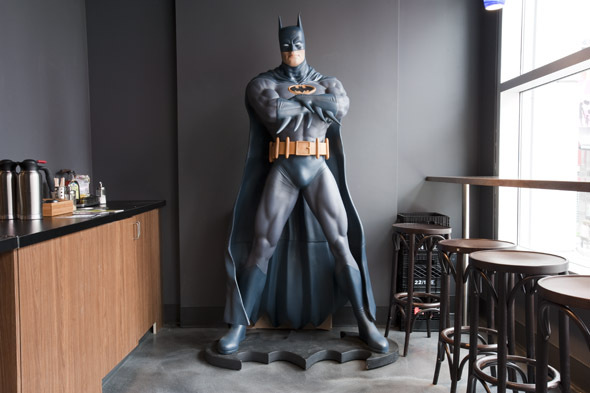 Located inside the new Silver Snail at Yonge and Dundas above HMV, Black Canary is pulling the same Nutella-infused espresso drinks as its location over on Sherbourne , except this spot comes with a great bird's-eye-view of Yonge, and a Batman statue that stares at you while you sip. Trust me â it's more magnificent than menacing. The marriage of the new Silver Snail and The Black Canary was a natural one. "My business partner, Mark," says Canary co-owner Luthie Lampa, "is part owner of the Silver Snail. They wanted to put a cafe in the new location, so we figured, 'Why not?' I've always wanted another one." 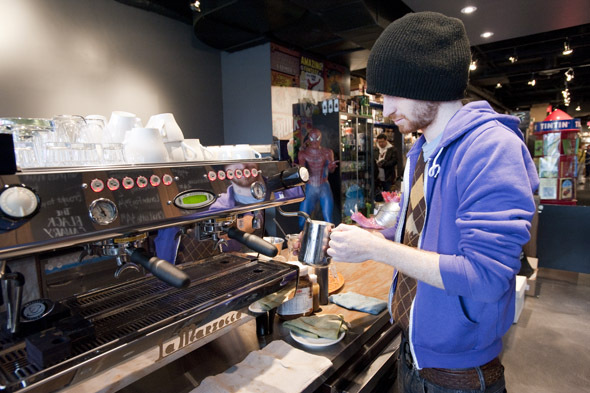 Until now, there haven't really been any independent cafes at or immediately by Yonge and Dundas . 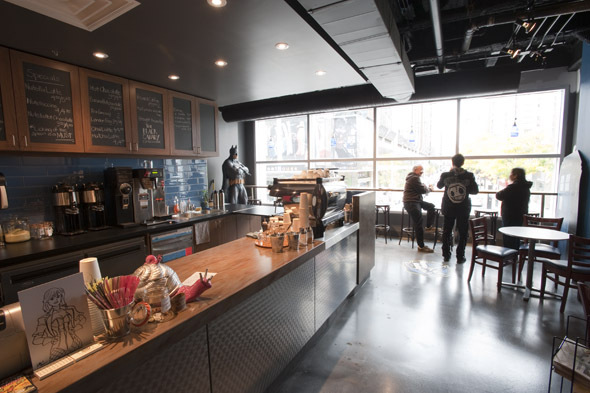 While there's Balzac's on the Ryerson campus and Rise Espresso a little further east, neither are visible from Yonge, and likely, don't have to fork over Yonge and Dundas-sized rent cheques. The Black Canary, on the other hand, has the good fortune (or good planning) of being a business within a business, and will soon boast some street-level signage. Even still, The Black Canary has enjoyed a steady wave of business since the Silver Snail opened its doors about two weeks ago. "It's a totally different scene," Luthie says, comparing this new Black Canary to the cafe on Sherbourne. "We're seeing a lot of tourists, and people with kids. 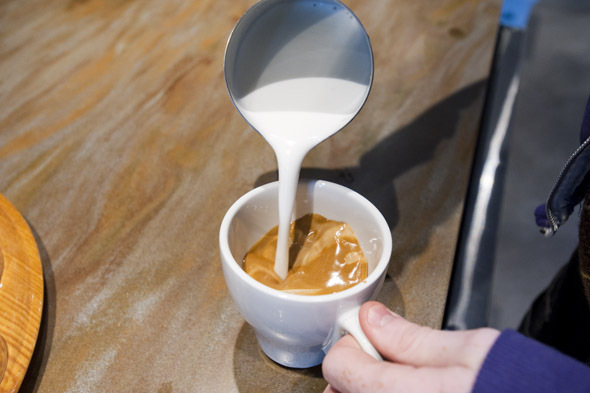 So we're trying to incorporate more kid-friendly drinks." Those kid-friendly drinks include options such as banana hot chocolate and hot chocolate with Nutella, along with The Black Canary's tried and tested roster of menu options. 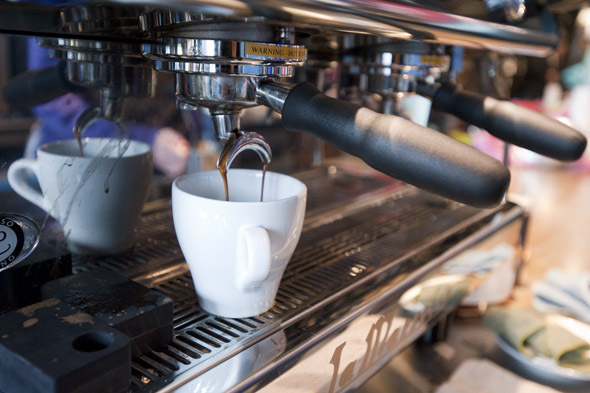 The list is essentially the same, with espresso ($3.00), Americanos ($3.00), macchiatos ($3.25), and more made with Rufino and Detour beans, plus Nutella-infused options such as the beloved Nutellacino ($4.00/$4.75) and Nutella Latte ($4.50/$5.25). You'll also find snacks from Desmond & Beatrice and Queen B Pastry , but unlike on Sherbourne, no sandwiches here. I, of course, opt for the Nutella Latte, and note the tip jar labelled "Donations for Gotham Orphans" while I wait for my drink. As always, it is incredibly smooth and creamy with just the slightest hint of Nutella, which is just enough since I was obliged to lick the spoon once it was crafted. I would've liked it just a little bit hotter, but the drink still managed to disappear within all of five minutes. 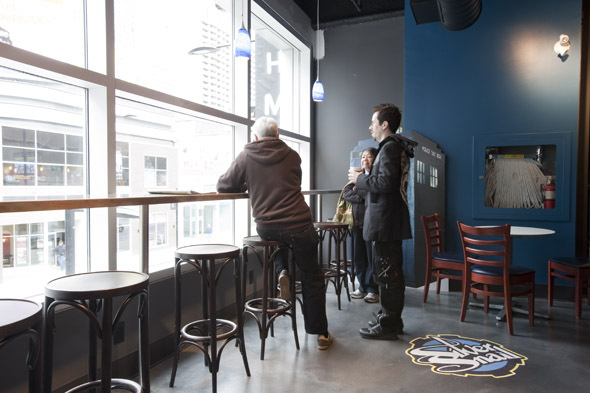 The Black Canary will be sharing the same hours as the Silver Snail, which invites customers to peruse its collection while sipping an espresso or munching on a muffin. However, unpaid merchandise cannot venture into the cafe section, lest any customer risk (direct quote) "Hulk Smash."